The first discussions about Fraggle Rock began in 1980, and the show was on the air by January 1983. However, the idea of a children’s entertainment piece that celebrated brotherhood and interconnectivity was something that had been percolating with Jim and Fraggle head writer Jerry Juhl for almost twenty years. In 1963, Jim was hired by the Celanese Chemical Company’s ad agency to provide two pillow puppets (probably made by Don Sahlin) which he and Jerry Juhl performed for a 60-second spot. Unlike the other commercials that Jim worked on during that period, he did not produce the commercial but merely provided the talent and puppets. Over the next year or two, the advertising manager from the Celanese Company, Frank Cosmen, discussed other projects with Jim and his team. He had an idea to have Rowlf perform at their spring sales meeting which ultimately did not happen. 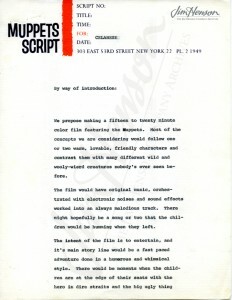 What intrigued Jim more was the opportunity to make a 15-20 minute film to be used on television and in stores. It was to launch a multi-year campaign and include new characters that could appear in print ads, as merchandise and at live sales shows. 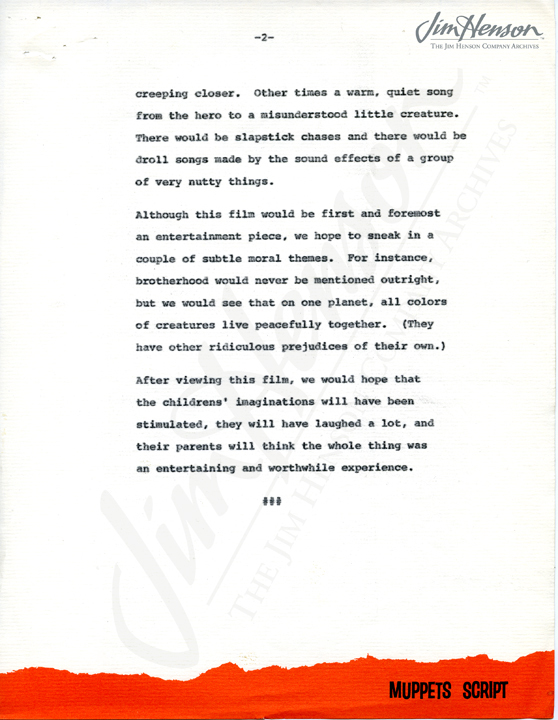 Jim brainstormed about what the film might be; his notes included things like “2 kids on a quest”, “mythical animals”, “action – humor – charm”, and “visit planets”. 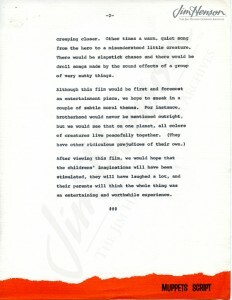 Jim and Jerry Juhl wrote up a two-page proposal detailing their concept which, in many ways, had a lot in common with what would become Fraggle Rock. The story would follow, “…one or two warm, lovable, friendly creatures and contrast them with many different wild and wooly-weird creatures nobody’s ever seen before.” The show would have original music and a storyline that would be, “…a fast paced adventure done in a humorous and whimsical style.” But most importantly, Jim and Jerry explained, “…we hope to sneak in a couple of subtle moral themes. For instance, brotherhood would never be mentioned outright, but we would see that on one planet, all colors of creatures live peacefully together.” This message of tolerance and understanding was one that Jim tried to teach throughout his career – in the songs of Sesame Street, the camaraderie of The Muppet Show, and eventually down at Fraggle Rock. Read about the development process for Fraggle Rock here. 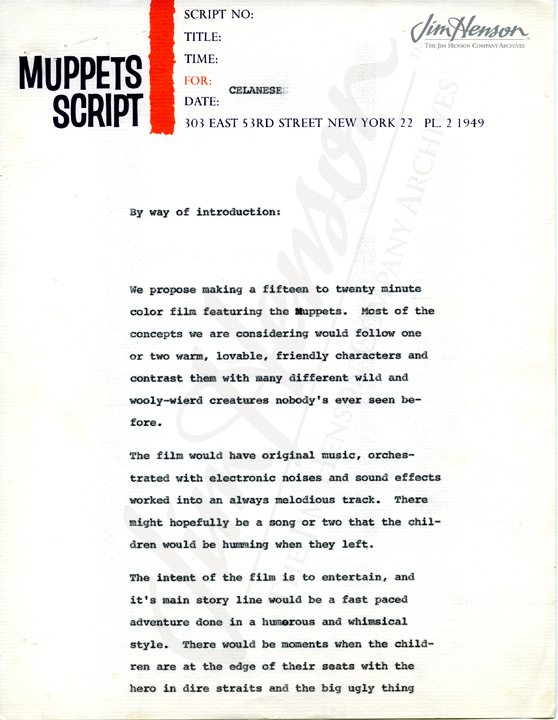 Jim’s proposal for a short film to be sponsored by the Celanese Chemical Company, mid-1960s. This entry was posted in 03-March '81, 1981, Fraggle Rock and tagged Celanese Chemical Company, Don Sahlin, Frank Cosmen, Jerry Juhl, Rowlf, Sesame Street, The Muppet Show. Bookmark the permalink.